Last night I switched over to pen and paper. What I did was walk through the thread and take the themes out of it. I would add a check mark for multiple requests. Some subjects are near to each other. Those, I'd tend to break down into separate categories because they wandered in different development paths. At first I was going to skip the things that are not development from high sec. I started the post with the intent on finding out what high sec development was in the eye of the reader. Yet, nerfs and suggestions to get people to leave high sec kept coming up. They were so constant and discussed that I decided to add in two more sections. Dynamic - Mission, mining, and the world. Choice - Allow NPC corp choice. Choice over who I hang out with while I am in a NPC corp. The third section was about why people where in high sec. There was a lot of honesty here and that is valuable. Is Risk vs Reward a valid view of Eve Online's development? I then went and made a word cloud to see if it told me anything. After that I went to the forum thread that was spawned. It was a very different beast let me tell you. One reason was that the original poster presented a question about what would you redesign or introduce to high sec? It created a different attitude. The forum thread also had several conceptual states that stood out. People should be incentive to move. Move did not mean leave high sec. It meant move around the game, leave high sec, stay in high sec but not be static through various discussions. High sec is not a newbie zone. Major themes that came through both of these reviews. The very last bit that stands out is control. Control is a major theme through this topic. Control of oneself. Control of others. Control of the environment. Control of our company, our choices, and our interactions. 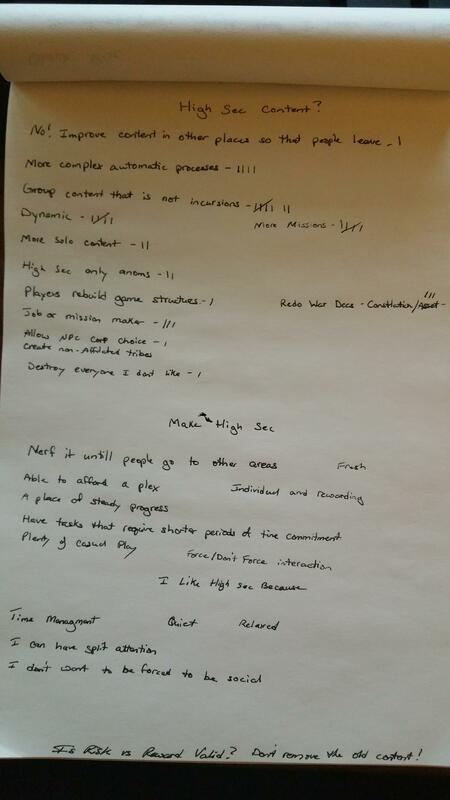 I've also had several blog posts spawn that go into details and ideas and concepts. This is just my general break down and thoughts into what I've seen and read over the last week from the players that have taken time to participate. I know that this is not a representative group of the entire game nor is every single idea presented here. I wanted to touch on the over arching themes that stood out to me. "Destroy everyone I don't like - I"
Thanks for doing this. It is really interesting to see who thinks what, and why which is something we miss. I decided not to eliminate the negative opinions and instead include them to see how loud they where. So on that rare occasion when I go looking for a mission, the type/level I am looking for seems to be available in very few locations. My old pals, the agents in Ebtesham, one of my haunts, don't send me out to kill things any more. That is there. I lumped it under dynamic missions and more content. Someone does a big break down of agents and moving them. There is also a call for more ways to distribute and gain missions. As well as the call for more levels 6 7 8 etc. The most telling thing about the sorry state of highsec is that the lowsec CSM is doing this. There is no one else who would speak for highsec. Because CCP does not support group play in High Sec. If you form a corp in High Sec you only gain disadvantages (except the 10%tax, pos), because you will get wardecced. And because hs players are doing PvE they will be scattered, because they have no chance against a pvp entity. The only communities in hs are the incursions, maintaining a chat for themselves, but each of them is in a NPC or 1 person corp.
PvE players usually come from a traditional MMORPG game, and crave for the "feel" of clans, making a chat based community is too cold for them, they dont feel united. I dont think they even care about the 10% tax either. They want a community tied together by a "clan". But if they get big enough, comes the wardec. Thats why I think CCP should make a corp type which pays 10% tax to concord for wardec-protection, cant deploy poses, cant gain sov. The only thing you lose is griefing which is the worst way to introduce hs ppl to pvp, very few ppl will get interested in going low/null when they get blowed up in a hs war. Why do you see wardec as a disadvantage? Wardec is only a disadvantage if you see highsec as a "safe place to make lots of money". It is, because pve players gets wardecced and have no chance. The game needs a mechanic which introduces them to PvP. Ganking and wardeccing miners and missioners are not a very good introduction. Therefore there is no high sec corps, no high sec community, they dont vote CSM, they dont care. If a player is not part of any community he wont read forums/blogs, and wont voice opinions and soon will quiot because of boredom, tired of gank/wardec. So if you want to keep players you have to make more content, and make meaningful introduction to low/null to hs players. There is a big scale of differences between safe, and get ganked or steamrolled by pvp players. The way I got interested in null sec was when I did HQ incursions with logi ships, and I realized, I just have to do the same thing (rep broadcast), but can do it in a community with its own corp and internal affairs. The only aspects of pvp at that time for me was: ganked. wardecced quit corp for NPC corp. Very bad advertisement for PvP in my opinion. Most players who quit are solo players. Because there is no High Sec community, low/null is not properly introduced and seems too much risk for them, they rather quit, then try and risk time and effort. @sorrowofeve, highsec players are not waiting to become something else. That's the main mistake eveybody does, CCP included. A highsec player is someone who is paying to play in highsec. Then, either that's worth his money, or he quits. And usually he quits, after a couple years since that is roughly what it takes to exhaust highsec. Highsec players don't need the rest of the game. They need more highsec to keep being highsec as they please. Null doesn't matters, lowsec doesn't matters, WHs don't matter. And when CCP adds new space or whatever comes with the player built gates, that will not matter neither unless it's highsec. Highsec players are paying for highsec. Everybody's insistence that they should play somewhere else instead only succeeds when they go to play another game. Keep in mind while reading this that, officially, the average number of characters per player in EVE is 1.6. Most people have one account total. If ~everyone you know~ has multiple accounts, then you don't know most EVE players. 1) The "space trucker" who enjoys flying the space lanes fulfilling contracts. 2) The person under a lot of stress who enjoys the hum of mining lasers. 4) People who particularly enjoy a minigame, like buying cool ships and trying out fits. 7) People who don't pay $15/month to get yelled at by some 20-year-old for having the wrong ship/not showing up for an op/etc. 8) They like watching pulse lasers, or the boom of a full rack of 1400s followed immediately by the eradication of the target, or some other specific thing. That list isn't exhaustive. It's just what I've personally run into talking to people. You can find some fascinating details by reading the bios of randoms as you warp around, too. The number of people I've run across in high sec who have found odd little niches is remarkably high. The number who resist any form of the sort of disciplined organization that marks a successful corporation in EVE is much higher. And, I have to say, the problem with high sec particularly and EVE generally is that the means of communication between players are terrible. Local is mistrusted (and frankly, way overbroad), private chat is too narrow, and voice comms are not desirable or accessible to everyone. Generally, you have to know the right person or go to the right web site to even know they exist. And if you have young children around the house, you have to be very careful about what you decide to have come through your speakers (headphones are problematic, because it's not a good idea to drown out your family, as much as you might sometimes wish to). One more-or-less constant of these activities is that war decs make them all exceedingly dangerous. Remember: one account, and intentionally small social circles with intentionally loose/no organization. I'm not saying these players are "good" or "bad," or that mine is the one true description of all high sec players. I'm offering anecdotes. One thing I don't see explained is why should people have to leave high-sec? I know CCP has shown that people who don't leave HS are more likely to leave the game, but that does not mean that they wanted LS PvP and didn't know about it - it just as likely means that they found HS stale after a while and didn't see anything else in the game 'for them'. There are many Sci-fi fans in the world - look at this past weekends movie numbers - and if we limit ourselves to those who want PvP, we'll shrink into a very small pack of wolves tearing at each other over the carcass of a diminished EVE online. I don't know. It comes up quite often and is linked to PvP focuses. There appears to be a belief that high sec is only a starting point and the real game exists outside of it. There is also the constant repetition that being killed makes people stay. As well as the idea that people stay because of groups. High sec allows individual freedom and self reliance at a higher rate then most areas of space. One could almost call it carelessness due to the relative security available. The last part has to do with the belief that the other areas of space are not as populated as they could be because people choose high sec due to the easiness of it. Normally, that ease is related to income. This group wishes to get players out of high sec because they believe that those players are only in high sec due to the relative ease. 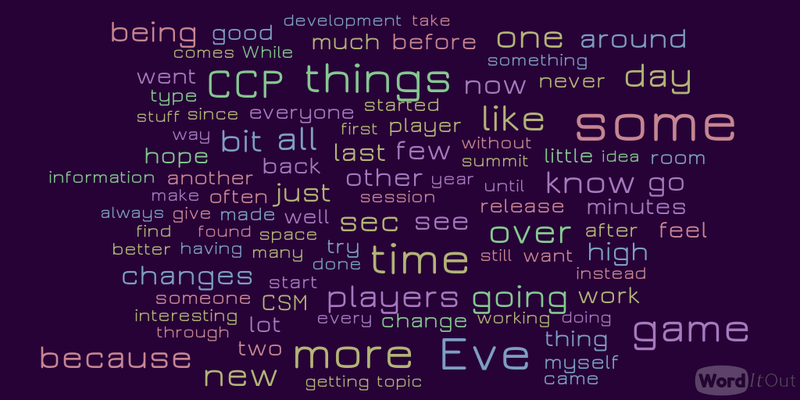 "I know CCP has shown that people who don't leave HS are more likely to leave the game" & "Ganking keeps players"
"finally don't give me stats about how getting ganked doesn't cause hisec players to leave the game...that is just lying with statistics CCP needs to look at the longer term players who have left the game cause they are tried of not being able to play the game without being harassed by extortionists. " Sorry Noslen but no one wants to know! The data they showed pretty clearly says being ganked early in a career keeps more players than it runs off. That being said, and this is only anecdotal. The type of people who stay in highsec and get ganked do hit a point to where they won't put up with it any more. I rarely see people rage quit over ganking, more common it just seems to be a slow build up of disillusionment with it until they stop logging in. It's the attention tax, not even the ganks themselves. All the little aggravating things you have to do to protect yourself from them just starts to wear people down. "Attention Tax" . . . what a great term you’ve coined - very illuminating. Just may explain why, over time, I shifted from resource gathering (mining, mishing) to manufacturing. As a manufacturer I spend much less time out in space and much more time in station managing the spreadsheets and eyeballing the stocks where inattention does little beyond slow the work. I suppose, compared to mining or mishing, it’s a more complex endeavor but in many ways it’s more leisurely too. Any thoughts on why so many players don’t move out of resource gathering? Jesus, Halcyon! Good concept. That's one of the reasons why I never considered moving away from highsec... everywhere else you feel like you must keep turning your head around looking for threats 24/7. Getting ganked isn't a big deal in your first month of play, where I think it really hurts new players is in the second month: Imagine you've got a nicer ship, or you're hauling too much of your personal net worth in one load - and someone takes it away from you. Perhaps you plead for ransom in local, and the pirate type just laughs, or hurls insults while their friend scoops your loot. Thinking about this loss, and paying for the next month is a big decision point: some players will be frustrated at the effort required to replace what they lost, and the attitude of their attacker. The ones who stay are somehow able to take it in stride and think about what they would do differently. If you're solo, the game doesn't always make it clear what could be done differently or methods to reduce your risk: that is what the NPE should teach. A reason there's so much emphasis on getting new players to join a player corp as soon as possible, where that kind of advice and support is hopefully available. I only went into manufacturing for isk because events conspired to give me an industry alt. It's not easy to get into because the nature of the market means the low hanging fruit just isn't there for return on investment. In the way back I lived in dronelands for awhile, instead of isk drones used to drop alloy which could be refined into minerals and sold. Unfortunately the market for minerals was highsec, and if you've ever been to dronelands... getting to highsec is a PITA. There isn't anywhere in the game that's got a longer pipe. But, my corp had a couple manufacturing slots on a POS that someone had the bright idea to place on it and never use. Me being mostly lazy and not wanting the headache of running that pipe constantly to sell alloy and restock... instead I started a blueprint copy farm in highsec, imported those to dronelands in big batches once every few weeks, rolled an industry alt, and produced everything locally with the massive mineral stocks. If not for that, I wouldn't have an industry alt with the skill points needed to turn a profit on the open market. For awhile I'm sure everything I built had a higher cost to build than anything sold in Jita did, but minerals were so abundant out there with so little work I just didn't care. I know that's not representative of everyone, but it might illuminate why people don't sidestep into industry. It's a big time investment in SP & Research to be profitable, and if you haven't had a reason to do it people just don't consider it. It's a huge time sink away from their main gameplay. "It's the attention tax, not even the ganks themselves. All the little aggravating things you have to do to protect yourself from them just starts to wear people down." Exactly Halycon. The point is that they are forcing new players out of the game. The ganking playstyle needs better balance but no one at CCP is willing or able to countenance such action. I went to sleep last night with thoughts of Attention Tax Fairies dancing in my head and awoke to the same delightful creatures conversing around the campfire. Fairy 1: At core were exploring a problem definition question. Note that Dire and Halycon treated ‘attention tax’ as a mechanic to be navigated. Dire, annoyed by the mining attention tax, shifted to manufacturing paying other players via off the market purchases to mine and shoulder the tax. Halycon, annoyed by a loooong taxing commute declared he’d build and sell where he sat. Other players in the very same thread don't treat attention tax as a navigable game mechanic but rather as an onerous unavoidable game killing pain point. Fairy 2: So which is it? Fairy 1: There’s no correct answer. 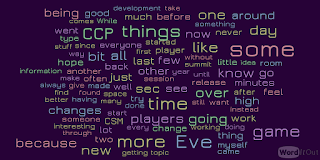 Players will conceptualize as they conceptualize and CCP will iterate as they iterate. Fairy 2: How inconclusive of you. Fairy 1: In an open universe that is Eve, all foundations are built of sand. It's the questions that matter, not the answers. Or so I've heard. 1) the characters were <15 day, on trial accounts, so no industrials, no barges, and frankly no significant assets at risk. 2) the difference in retention between "ganked" and "not ganked" was 5%. Rise also didn't count as a gank any combat where the newbie shot back, which, given that people on trial accounts can't fly anything that can't hit back (the Venture has drones), seems like an odd decision. Either way, you're talking about a case where the players have next to no investment in anything, and the most you can say about the difference is that it might be statistically significant given the rather poor confidence interval forced by the small sample size. Not to say that ganking is bad/evil/whatever, just that the data we have been given doesn't add much to the conversation. I appreciate your thoughts and analysis and it is nice to hear that the refion is receiving attention. While I do not live in high sec and to be honest rarely even visit the place , I do think that getting high sec right is very important to the future of the game and that its sad state is retarding growth. I want hisec to be more interactive. NPC pirates to do their jobs and attack travelers/traders as they move through space -- not just lurking in fixed locations. I want floating security statuses for systems. System is a .5 on a major trade route w/perpetual ganking -- should fall into low security status. Tired of that being the only trade route, get in there and kill off the PC pirates/villains and raise the sec status rise to concord protected hisec. Thos sorts of changes could be a LOT of fun. They could be a lot of fun and they could be devastating. Anything like that can be gamed and gamed systems are unhealthy. Eve also has the interesting fate of being a game that people leave and return to over long periods of time. They can pick back up without much devalument. If sectors of space started to swing widely in their security stats we'd have large numbers of stranded players. You may consider that a lot of fun. I may consider that a lot of fun. It may be challenging and interesting but fun is relative. Players who we are currently struggling to understand what motivates them, players who stay in high security space at all times, wind up caught in these 'fun' changes for another group. Such situations are enough to cause a player to walk away from the game. Now, I once suggested we develop another layer of space that is more dynamic in this way. No concord and just NPC police to create its own flavor of combat. But such things should be optional to enter. That goes back to not taking content away from people who love it just because someone else wants change. A systems security status is content someone has willfully chosen to engage with. +1. We are being prepared for the idea that player-built stargates may also lead to new areas of space. That *new* space is where game designers can fairly bring in new game rules, like a floating sec status. However that might work. New loot needed to build something desirable, is the lure that would bring explorers and traffic of all kinds, to the new space. As Sugar pointed, your ide of "fun" is would not be "fun" to the average highseccer. I recall a month or so back you mentioned considering a blog name change. If such thoughts still lurk about may I suggest “Taboo”? This exploration you’ve undertaking really plays to your executive function skill strengths and it’s tremendous pleasure to be brought along the ride with you. That sounds quite fancy. I'm not sure if I fully qualify for such an amazing type name. I quit Eve a while back. If I came back it would be to run missions in high sec or play on the test server. Eve is about risk and I loved that, but now I don't want to come home after spending all day trying not to screw up and then worry about losing a carrier w-space. I haven't found a game that I enjoy playing as much as Eve yet, so I do hope high sec has improved if I come back. Now to topic...for all the null players out there: Hi Sec isent save! Except in the Newbro Startersystems and being a Newbro...you can be attackt anywhere at anytime, yes concord pops your ship, but i thought real PvPers dont care about ships? Wardecs, baiting, killrights, ganking duelling...many ways to get fights...or isit that some just want easy week kills with no risk? I heard risk aversion is great in null sec these days. Yes Hi sec needs an overdoo, but thats is on the agenda. The biggest problem, as some players in the forum thread have pointed out. Are the LP`s. Concord and Faction, or rather the conversion of CONCORD LP to faction LP (and you null players dont think that dosent concerns you too! You Fly faction ships gaind throught LP`s!). Same for WH and the T3 problem, maybe there is a "simpel" solution. Throught farming. Well RL farming. If a field is used to often with the same crops it will not let anything usefull grow there in time. So farmers alternate between fields and let other fields empty for an amount of time. For EvE i think this could be aplied as folowing: In WH space: If you farm a WH endlessly the Sleepers say, scew you and cloak up for, lets say 3-4 Months. But if you limit farming from DT to DT to 3-4 Sites it will still be activ. This could be a tactic to burn a WH for others, fights for not harvested WH may break out to. It could be that all WH dry out(yes they will not i know), but that could limit the use of T3 or increas prices to them. Bcause the resource is scarce(like in the old days). Hi Sec Incursions: Same Idea. If farmd like BRave once, Sansha could say screw Hi sec for x amount of time, but woul increas in areas in Low /Null where they met poor or none resitance at first. Change the LP system (witch is over my head) somehow that the cashout is less, same as with FW (witch again not my area to seed ideas). So that the most lucrativ ISK flow isent steady but random. And yes ganking is a legit gameplay it must stay, but players who just like a space game, like me and many others! have the same right and argument to play EvE as the PvPer(with his ratting alts of course). That’s a Hell of a list, I especially enjoyed the word cloud. My opinion is that the people that are ganking and extorting the HS people, for whatever reason, should have less options than the people that obey the rules in HS. High Sec is where I've made my home for the better part of a decade. I've roamed through Low as a pirate and puttered about Null and W-space with some friends, but I've always come back to High Sec as I get mentally worn out quickly. Halycon has mentioned an "Attention Tax" and that's apt for what hits me. I've also developed some health problems that have kept me from diving too deep into anything these days. I've turned into one of the casual players, I've played a long time, but I can't invest a lot of time into the game any more, due to reasons beyond the game. Let's look at what I do in the little time I get. I might run a L2 or L3 mission. Go searching for minerals to build another ship and kit with. I might trade, mostly I just hop in my Condor and fly around space seeing what is going on. I've jumped in and helped people finish missions, gone and buzzed miner's in belts, tried to start races with others in my souped up Punisher. I don't bother with PLEX anymore, I make enough outside the game to pay for my time inside and it's win when I can undock once a week for an hour. High sec is my home because I don't fit in anywhere else. I don't have the time, health or attention to spare for Low/Null/W-space. I'm a casual misfit, a friendly loner, my SP are all over the place and I am lucky to a have a place I can fly without getting frakked on sight. I can see everything I'd suggest on the list above though. Competitive/Cooperative missions would be fun, especially because you could get a fairly wide mix of content added, from races to duels, to multi part puzzles. Making the world more dynamic and alive would be amazing. More things like the Sleepers, the Drifters, Burner type events. Give me more dynamic ways to get missions, be it from a travelling agent, a besieged trader or a damsel in your hold who does not want to go back to her father. More options inside those missions would be nice as well, let them branch, let a failure lead to another possible outcome. A mission creator would be amazing, though I'd probably spend more time making missions than playing if it came out. Really I'd like to see more of anything which would make me want to undock more. I played for a year and a half nonstop every day for 3-4 hours in low sec until my son was born. I still love the game but I could not do the low sec pirate pvp in groups as my little one sleeps and then gets up crying. It meant I could not FC anymore and also being a member of a small pvp group meant they could not rely on me when a target was found as I would have to warp out as soon as my little one stated with his care bear tears. I went solo and this was great for a time but I got bored very quickly. I could not join null because of the same reason and could not move to a WH because of the same reason. It meant that I had to move to High-sec. It meant that I needed to change my game style to a more solo player game which I can tell you now CCP do not like and will not improve. High sec should be made a more solo play style area where the missions are not go here shoot and collect something and come back to me for isk and LP. High sec missions should be story driven where the new player gets to be part of the universe and every level is linked in some way and part of a chain of missions. New players will learn about the lore around EVE more in these and feel a bigger part of it. Missions that are the same from 1 to 5 has worked in the past but that is also because people expectations was maybe not what it is now. New players need to learn from people but if you look for a good corp that is really new player friendly and I mean really new player friendly then they are very poorly advertised and run. I have created many new pilots to test this theory and every time I join a corp and feel after a week that the corp is not in any new players best interest as they do not involve you in anything they do or you are in high sec when they are in null and trying to get you out there when you asked for a high sec corp in the corp finder. You trying to tell us something, Sugar? One thought about those who charge "Attention Tax" and suicide gank if you don't pay..why not make it a real suicide gank...not just the ship but the pod too? That's interesting: if someone shoots a ship or pod in highsec, CONCORD takes only the attacking ship. Would it not make sense for CONCORD to take out both the attacking ship and its pod, if the attacker is going after pods? If this became the new rule, most suicide attacker pods would quickly be empty of implants. But, the idea would fit with "an eye for an eye" type of justice, even if in most cases the attacking pod had no implants. CCP Soundwave in his last Fanfest talk, discussed a number of things that he had learned over the years as a dev, one of which was that nerfing hisec would not cause hisec players to leave hisec for losec and 0.0 rather it would cause them to leave hisec for other games....this lesson seems to be lost on most players and CCP Devs as is evidenced by the application of variable taxes and fees on Hisec Industry (even if you own your own POS you still get charged fees and taxes). This does not make Losec and Null more appealing to the average hisec player, it makes them feel disenfranchised. High sec has to make sense on its own terms, and consequently content should be about being interesting, not about leading to other things. Should there be advantages of less secure space? Of course, but that's their problem. High sec has it's own narrative going on, which is the contest of power and security amongst the established non-capsuleer powers. What do the capsuleers that live there want? To make a little isk and destroy the competition. They want wars that make sense and reflect the pursuit of the bottom line. It would be good to have structures that help out with putting things on the market or getting missions from the resident empires (or the opposition). It would be good to have wars that focus on those structures. It would be good if the empires and npc corps enforced their own sense of order on their own space. If miner Joe wants better refining, he shouldn't go pay high fees at an Ishukone station, but build his own refinery. Miner Steve might take umbrage at the competition, and declare a limited war against that structure. Now he can shoot it without getting a suspect flag. However, he will still have a limited engagement with the owner. If there's a desire to have it out with the owner more generally, Concord should proscribe it to a range of systems, maybe a constellation or even an entire region, but no more. If players at war decide to go weapons free near a population center, the resident station overseers or their corp aren't obliged to look the other way in the face of such likely hazards. They can open up with station defense guns or even make the hooligans have suspect timers. Likewise on gates. This forces conflicts to be about assets, and not about simulating nullsec conditions under the indifferent eyes of Concord and factional navies. Whether any population makes good isk along the way shouldn't be a consideration. People get rewarded when they contribute things of value to others. Shooting NPCs in any part of space isn't especially valuable to other players, at least not until those items go on the market. On the other hand, meeting a market need, where it is needed anywhere there is substantial demand is worthwhile. Remote depots are hard to stock by a limited number of players. In general, despite free range capitalism, most regions are starving for stock and competition. I propose that the most first tier of provisions be simplified somewhat, and be eminently accessible to players just starting out. How? Low level invention. Make T1 products, and invent them directly into meta. Rarity based fittings are pointless and limit conflict. Non-rare components are simply gun mining. Metacide should be about specialization, be it for range or brawling, or whatever. I don't care about what I've got invested in arbalest launchers because I'd rather have a playable game were basic pvp frigate fits don't cost >20M isk. Don't make it harder to learn the game than it needs to be. Extend the range of traders by letting them use their full trading skill set and market slot allotment at each station. If they like to travel through space with tons of loot on board, then reward them rather than punish them for straying from a single station. If balance is needed, reduce total market order slot gain from skills, but only per station. Being more specialized means being more keenly aware of competition over those product lines. Missions have a place. Should they keep you in PLEX? Probably not, but only because they contribute little value to other players. LP stores should be a little more practical, and less focused on being exotic goods. LP should be just as valuable as ISK, but that's not a reason not to maintain needed faucets. The exotic goods are those which people fight over because they are scarce. I don't mind seeing Duvolle pushing out blueprint copies and single use skins routinely. That just makes sense. What does concern me is what Duvolle asks of capsuleers. The navy should mostly have things in hand. Duvolle, meanwhile, is more interested in undermining domestic competition. The vast majority of NPC you should encounter should be neutrals. They might be interested in having you keep tabs on Roden shipyards, perhaps by hacking some of their communications arrays. What's the Navy want from you in highsec? Well, it shouldn't be to fight off an armada of Serpentis in their core systems. They send you off to the frontier for that. No, I think they looking at more domestic problems and emergency situations. They are probably also interested in outsourcing supplies, or having assets constructed, tested or repaired by contractors. When working in secure space, standing should mostly be shifted between npc corps in secure space, and within that faction. To muddy the standing between factions, players should mostly be working in logical areas of space. However, they should fairly be compensated with LP for whatever work the do, and whatever value they contribute to the NPC groups. As someone who hangs around in highsec a lot, I would like the CSM to tell CCP to take more time for the Contracts Little things thread, there is so much in there to make the live of scaling a corp more easy. When corps scale up more easyly, they can also step up their game in wardecs and eventually ventures outside their comfortable highsec.